Three $1,000 scholarships reward high school students working with older adults and developing innovative solutions to aging. 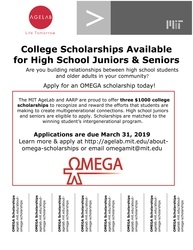 Through the generous sponsorship of the MIT AgeLab and AARP, OMEGA is proud to offer three $1000 college scholarships to recognize and reward the efforts that young adults are making to create multigenerational connections. High school juniors and seniors living in one of the six New England states (Connecticut, Maine, Massachusetts, New Hampshire, Rhode Island and Vermont) are eligible to apply for scholarships. Each OMEGA scholarship will award a $1000 college scholarship to the winning student and $1000 to the winning student’s intergenerational program to support its activities to build relationships between teens and older adults. We particularly encourage students who are working with older adults in the areas of transportation, livable communities, technology, services, caregiving, and wellbeing. Visit http://agelab.mit.edu/about-omega-scholarships for more information!